MCBSP_ENABLE_HP_DIRECTIVES and MCBSP_ENABLE_FAKE_HP_DIRECTIVES are mutually exclusive. Defines the run-time mode of MulticoreBSP for C.
Not compiling in the default performance mode (MCBSP_MODE == 1) will print warning messages at compile time. The debug mode (2) makes MulticoreBSP perform more internal checking and more user argument sanity checking. 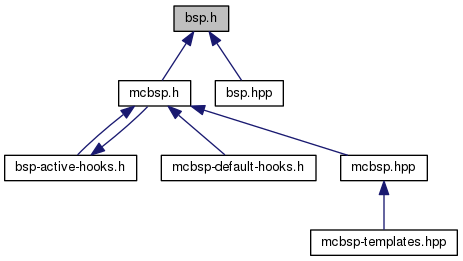 It will also make MulticoreBSP use POSIX Threads barriers for synchronisation (instead of the default spinlocks) so to induce better behaviour on debuggers such as Valgrind, which rely on a serialised execution of SPMD programs. The profile mode collects various statistics at run-time and reports them when the SPMD program collectively enters the bsp_end. 1: performance mode (default). 2: debug mode. 3: profile mode. Referenced by bsp_abort(), and bsp_vabort(). Data type used to count the number of BSMP messages waiting in queue. Data type used for thread IDs. Data type used to refer to memory region sizes.